La Fagotiere is an old property in the Southern Rhone Valley. It was founded all the way back in 1889. Located in the northern part of the Chateauneuf du Pape appellation, La Fagotiere is still owned and managed by the same family today. Pascal Chastan, the current owner is the 5th generation of his family to run the domaine. La Fagotiere owns 17 hectares of vines in Chateauneuf du Pape. 16.2 hectares are used to grow grapes for making red wine. .7 hectares are reserved for white wine grapes. The family produces wine in the Cotes du Rhone from 15 hectares of vines they have planted there. La Fagotiere also produces outstanding olive oil from organically farmed trees. In 2012, La Fagotiere has been certified as Agriculture Biologique. Customers can order unique, customized bottles of La Fagotiere from the domaine. 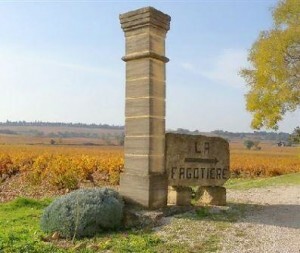 La Fagotiere produces 1 Chateauneuf du Pape red wine, and 1 Chateauneuf du Pape Blanc. La Fagotiere Chateauneuf du Pape is produced from a blend of 80% Grenache, 10% Mourvedre and 10% Syrah. The grapes are not destemmed. Vinification takes place in cement vats. The wine is aged for between 12 to 18 months in used, French oak barrels and foudres. The length of time for the aging depends on the character of the vintage. On average, 1,000 cases of wine are produced here each year. La Fagotiere Chateauneuf du Pape Blanc is produced from a blend of 30% Grenache Blanc, 30% Clairette, 30% Roussanne and 10% Picpoul. The wine is aged in tank for 6 months. Close to 150 cases are produced each year. La Fagotiere can be enjoyed young. Young vintages can be popped and poured, or decanted for about 1 hour, give or take. This allows the wine to soften and open its perfume. Older vintages might need very little decanting, just enough to remove the sediment. La Fagotiere is usually better with 2-3 years of bottle age. Of course that can vary slightly, depending on the vintage. In the best vintages the wine should be consumed within 3-8 years after the vintage. La Fagotiere is best served at 15.5 degrees Celsius, 60 degrees Fahrenheit. The cool, almost cellar temperature gives the wine more freshness and lift. La Fagotiere is best served with all types of classic meat dishes, veal, pork, beef, lamb, duck, game, roast chicken, roasted, braised, stewed dishes, sausage, barbecue and cassoulet. La Fagoriere is also good with Asian dishes, hearty fish courses like tuna, mushrooms pasta, eggplant, tomatoes and cheese. The white wine of La Fagoriere is best served with a myriad of different seafood dishes, shellfish, crab, lobster, sushi, sashimi, chicken, pork and veal, as well as Asian cuisine. Medium bodied, elegant, forward, soft, fresh and sweet, there is a polish to the tannins and a peppery character to the ripe, black raspberry and kirsch notes. The wine is made from blending 70% Grenache with 30% Mourvedre. Soft textured, medium bodied, spicy and loaded with garrigue on the palate and the nose, the finish offers olives and kirsch in the endnote. The wine was produced from 70% Grenache, 25% Syrah and 5% Mourvedre. Spicy, with a blast of garrigue to compliment the kirsch core of fruit. Medium bodied, forward and ready to drink tonight. Sweet, fresh raspberries in a lighter style of wine that will show best in its youth. Fresh, short and sweet, the wine is spicy with red plum and cherry tones. Medium bodied, focused on bright, red fruits with a slight drying sensation in the finish.